The Taiwan Society of Ksitigarbha Studies asked us to create a set of design standards and guidelines for temples to Ksitigarbha in locations throughout the world. 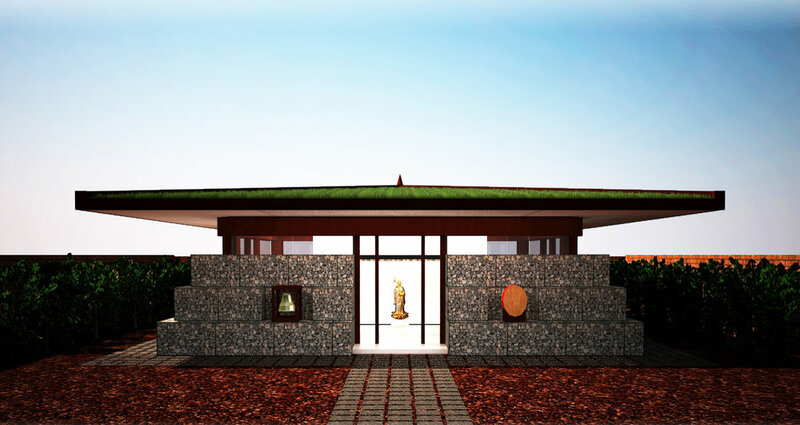 These temples to Ksitigarbha Bodhisattva are intended to be places of prayer and meditation, and this proposed design is intended to create sanctuaries that will be serenely powerful settings for this purpose. The architecture should express the profound nature and force of the spiritual practice for which the building is intended. Sustainable building practices and technologies should be incorporated into the design of the building. Some potential temple locations may not have the resources or expertise to build a structure that is too complex. The 15m x 10m interior space of each temple is covered by an expansive, grass-covered green roof, which dramatically extends beyond the footprint of the building to provide shelter for circumambulating the temple and is supported by a column-and-beam structure that lifts it so that it appears to float above the walls of the building. The walls of the building are made of gabions stacked in tiers that step back and are structurally separate from the roof and its supporting structure. The design of the interior is an entirely new concept of sacred space that, by being anchored upon profound foundations of spiritual teachings, will serve to deepen the spiritual practice of devotees who come to the temples.